Grasp fire alarm basics and how proper inspection, testing, and maintenance are critical to signaling system effectiveness. 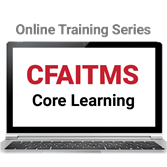 Take the Certified Fire Alarm ITM Specialist (CFAITMS) for Facility Managers Core Learning Series based on the 2016 edition of NFPA 72®. Every facility manager must understand the components of a fire alarm system, basic ITM, and how NFPA 72®: National Fire Alarm and Signaling Code® helps ensure the system is able to function as intended. This two-part training series covers the basic configurations and terminology used for fire detection and alarm systems; power supply requirements and circuits that drive and connect the building blocks of fire alarm systems; and general provisions in NFPA 72 involving management of inspections, tests, and system impairments. Work at your own pace to gain vital insights into all types of systems, and learn about personnel responsibilities and qualifications. The training helps you prepare for accreditation programs such as the NFPA Certified Fire Alarm ITM Specialist (CFAITMS) for Facility Managers.